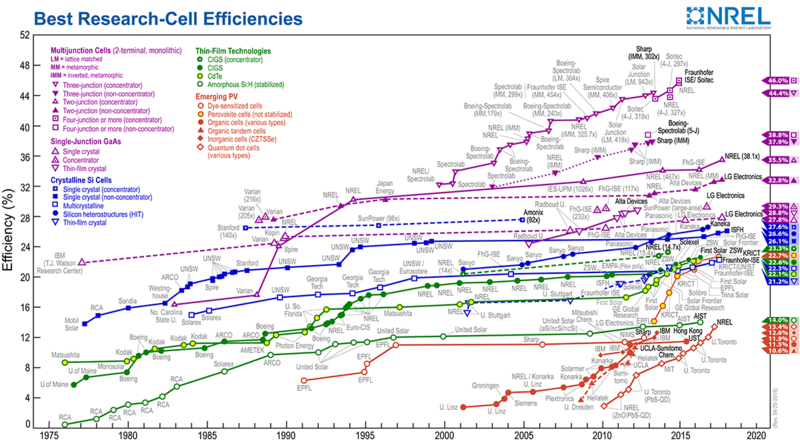 Long-term device stability is the most pressing issue that impedes perovskite solar cell commercialization, given the achieved 22.7% efficiency. The perovskite absorber material itself has been heavily scrutinized for being prone to degradation by water, oxygen and ultraviolet light. To date, most reports characterize device stability in the absence of these extrinsic factors. Here we show that, even under the combined stresses of light (including ultraviolet light), oxygen and moisture, perovskite solar cells can retain 94% of peak efficiency despite 1,000 hours of continuous unencapsulated operation in ambient air conditions (relative humidity of 10–20%). Each interface and contact layer throughout the device stack plays an important role in the overall stability which, when appropriately modified, yields devices in which both the initial rapid decay (often termed burn-in) and the gradual slower decay are suppressed. This extensively modified device architecture and the understanding developed will lead towards durable long-term device performance. Manser, J. S., Christians, J. A. & Kamat, P. V. Intriguing optoelectronic properties of metal halide perovskites. Chem. Rev. 116, 12956–13008 (2016). Manser, J. S., Saidaminov, M. I., Christians, J. A., Bakr, O. M. & Kamat, P. V. Making and breaking of lead halide perovskites. Acc. Chem. Res. 49, 330–338 (2016). Habisreutinger, S. N., McMeekin, D. P., Snaith, H. J. & Nicholas, R. J. Research update: strategies for improving the stability of perovskite solar cells. APL Mater. 4, 91503 (2016). Saliba, M. et al. Cesium-containing triple cation perovskite solar cells: improved stability, reproducibility and high efficiency. Energy Environ. Sci. 9, 1989–1997 (2016). Shin, S. S. et al. Colloidally prepared La-doped BaSnO3 electrodes for efficient, photostable perovskite solar cells. Science 356, 167–171 (2017). Dualeh, A., Gao, P., Seok, S. Il, Nazeeruddin, M. K. & Grätzel, M. Thermal behavior of methylammonium lead-trihalide perovskite photovoltaic light harvesters. Chem. Mater. 26, 6160–6164 (2014). Nenon, D. et al. Structural and chemical evolution of methylammonium lead halide perovskites during thermal processing from solution. Energy Environ. Sci. 9, 2072–2082 (2016). Conings, B. et al. Intrinsic thermal instability of methylammonium lead trihalide perovskite. Adv. Energy Mater. 5, 1500477 (2015). Yang, J., Siempelkamp, B. D., Liu, D. & Kelly, T. L. An investigation of CH3NH3PbI3 degradation rates and mechanisms in controlled humidity environments using in situ techniques. ACS Nano 9, 1955–1963 (2015). Aristidou, N. et al. Fast oxygen diffusion and iodide defects mediate oxygen-induced degradation of perovskite solar cells. Nat. Commun. 8, 15218 (2017). Hoye, R. L. Z. et al. Perovskite-inspired photovoltaic materials: toward best practices in materials characterization and calculations. Chem. Mater. 29, 1964–1988 (2017). Steirer, K. X. et al. Defect tolerance in methylammonium lead triiodide perovskite. ACS Energy Lett. 1, 360–366 (2016). Li, Z. et al. Stabilizing perovskite structures by tuning tolerance factor: formation of formamidinium and cesium lead iodide solid-state alloys. Chem. Mater. 28, 284–292 (2016). Sutton, R. J. et al. Bandgap-tunable cesium lead halide perovskites with high thermal stability for efficient solar cells. Adv. Energy Mater. 6, 1502458 (2016). McMeekin, D. P. et al. A mixed-cation lead mixed-halide perovskite absorber for tandem solar cells. Science 351, 151–155 (2016). Wang, Z. et al. Efficient ambient-air-stable solar cells with 2D–3D heterostructured butylammonium-caesium-formamidinium lead halide perovskites. Nat. Energy 6, 17135 (2017). Manspeaker, C., Venkatesan, S., Zakhidov, A. & Martirosyan, K. S. Role of interface in stability of perovskite solar cells. Curr. Opin. Chem. Eng. 15, 1–7 (2017). Sanehira, E. M. et al. Influence of electrode interfaces on the stability of perovskite solar cells: reduced degradation using MoO x /Al for hole collection. ACS Energy Lett. 1, 38–45 (2016). Zhao, L. et al. Redox chemistry dominates the degradation and decomposition of metal halide perovskite optoelectronic devices. ACS Energy Lett. 1, 595–602 (2016). Li, Z. et al. Extrinsic ion migration in perovskite solar cells. Energy Environ. Sci. 10, 1234–1242 (2017). Dawson, J. A. et al. Mechanisms of lithium intercalation and conversion processes in organic–inorganic halide perovskites. ACS Energy Lett. 2, 1818–1824 (2017). Habisreutinger, S. N. et al. Carbon nanotube/polymer composite as a highly stable charge collection layer in perovskite solar cells. Nano Lett. 14, 5561–5568 (2014). Leijtens, T. et al. Hydrophobic organic hole transporters for improved moisture resistance in metal halide perovskite solar cells. Appl. Mater. Interfaces 8, 5981–5989 (2016). Nguyen, W. H., Bailie, C. D., Unger, E. L. & McGehee, M. D. Enhancing the hole-conductivity of spiro-OMeTAD without oxygen or lithium salts by using spiro(TFSI)2 in perovskite and dye-sensitized solar cells. J. Am. Chem. Soc. 136, 10996–11001 (2014). Habisreutinger, S. N., Noel, N. K., Snaith, H. J. & Nicholas, R. J. Investigating the role of 4-tert-butylpyridine in perovskite solar cells. Adv. Energy Mater. 7, 1601079 (2016). Reese, M. O. et al. Consensus stability testing protocols for organic photovoltaic materials and devices. Sol. Energy Mater. Sol. Cells 95, 1253–1267 (2011). Leijtens, T. et al. Overcoming ultraviolet light instability of sensitized TiO2 with meso-superstructured organometal tri-halide perovskite solar cells. Nat. Commun. 4, 2885 (2013). Roose, B. et al. Mesoporous SnO2 electron selective contact enables UV-stable perovskite solar cells. Nano Energy 30, 517–522 (2016). Ihly, R. et al. Efficient charge extraction and slow recombination in organic–inorganic perovskites capped with semiconducting single-walled carbon nanotubes. Energy Environ. Sci. 9, 1439–1449 (2016). Domanski, K. et al. Not all that glitters is gold: metal-migration-induced degradation in perovskite solar cells. ACS Nano 10, 6306–6314 (2016). Cacovich, S. et al. Gold and iodine diffusion in large area perovskite solar cells under illumination. Nanoscale 9, 4700–4706 (2017). Schulz, P. et al. High work function molybdenum oxide hole extraction contacts in hybrid organic–inorganic perovskite solar cells. ACS Appl. Mater. Interfaces 8, 31491–31499 (2016). Zhao, Y., Nardes, A. M. & Zhu, K. Effective hole extraction using MoO x –Al contact in perovskite CH3NH3PbI3 solar cells. Appl. Phys. Lett. 104, 213906 (2014). Wojciechowski, K., Saliba, M., Leijtens, T., Abate, A. & Snaith, H. J. Sub-150 °C processed meso-superstructured perovskite solar cells with enhanced efficiency. Energy Environ. Sci. 7, 1142–1147 (2014). Ahn, N. et al. Highly reproducible perovskite solar cells with average efficiency of 18.3% and best efficiency of 19.7% fabricated via Lewis base adduct of lead(ii) iodide. J. Am. Chem. Soc. 137, 8696–8699 (2015). De Souza, R. A. & Martin, M. Probing diffusion kinetics with secondary ion mass spectrometry. MRS. Bull. 34, 907–914 (2009). Stevie, F. A. Secondary Ion Mass Spectrometry: Applications for Depth Profiling and Surface Characterization (Momentum, London, 2015). Wilson, R. G., Stevie, F. A. & Magee, C. W. Secondary Ion Mass Spectrometry: a Practical Handbook for Depth Profiling and Bulk Impurity Analysis (Wiley-Interscience, Hoboken, NJ, 1989). This work was supported by the Hybrid Perovskite Solar Cell Program, and B.T.V. was supported by the Organic Photovoltaic Program, which are funded by the US Department of Energy (DOE) under Contract No. DE-AC36-08-GO28308 with the National Renewable Energy Laboratory through the US DOE Solar Energy Technologies Program. J.A.C. was supported by the DOE Office of Energy Efficiency and Renewable Energy (EERE) Postdoctoral Research Award through the Solar Energy Technologies Office under DOE contract number DE-SC00014664. We thank B. To for the SEM imaging, A. Hicks for assistance with the graphics, and A. Paquin and F. Bélanger of PCAS Canada for supplying 2,7-dibromocarbazole as a precursor for the synthesis of the EH44 HTM used in this study. J.A.C, J.M.L. and J.J.B. conceived the project. J.A.C. fabricated the devices and thin-film samples. P.S. designed and performed the photoemission experiments and analysed the data. J.S.T. and T.H.S. synthesized and characterized EH44, and A.S. supervised. J.A.C. and B.J.T.V. performed the stability experiments. S.P.H. performed the ToF–SIMS measurements and S.P.H., J.A.C. and P.S. analysed the ToF–SIMS data. J.M.L. supervised the entire project. J.A.C. wrote the first draft of the paper. All the authors discussed the results and contributed to the writing of the paper. Correspondence to Joseph J. Berry or Joseph M. Luther.